Potty training help – yes, we all need it, but we often haven’t a clue where to go for it! Potty training is a key milestone in your little one’s life. Yet, we all seem to dread it; some go to soon, some leave it as long as they can, but most dread it. So, we were keen to take a look at the latest piece of kit for potty training help on the market; The Family Seat. We have also get a great offer for you on getting The Family Seat for yourself – if you visit the site and put in the code KC15A* on checkout you get a fabulous 15% off! While you go take a look at it, why not see what we thought of it? We’ve given it a bit of a test run, and here is what we think. How does the Family Seat give you potty training help? So, The Family Seat is a wee *see what we did there* bit clever. Both my children, particularly my youngest, didn’t want to use the potty. They wanted to be like me, or in the case of my son, their big sister. So we thought – why can’t they just use the toilet? One of the main problems with going straight to the toilet for potty training is that kids have a tendency to get a little bit stuck. And THAT is no way to encourage them to either transition from the potty, or start their potty training going straight to the loo. Two and three year olds have irrational fears, and one of the ones that is much more common that you think is getting stuck, or worse still, falling into, the loo! Yes – to an adult, this fear might just seem silly, but to a two-year old, it is very, very real. It is simple to fit, with just a few basic instructions (it comes with screws and brackets of course), and VOILA. You and your child are good to go using it. The seat has a reward chart included, as well well door hangers, so you have everything you need to make toilet training a little bit easier. 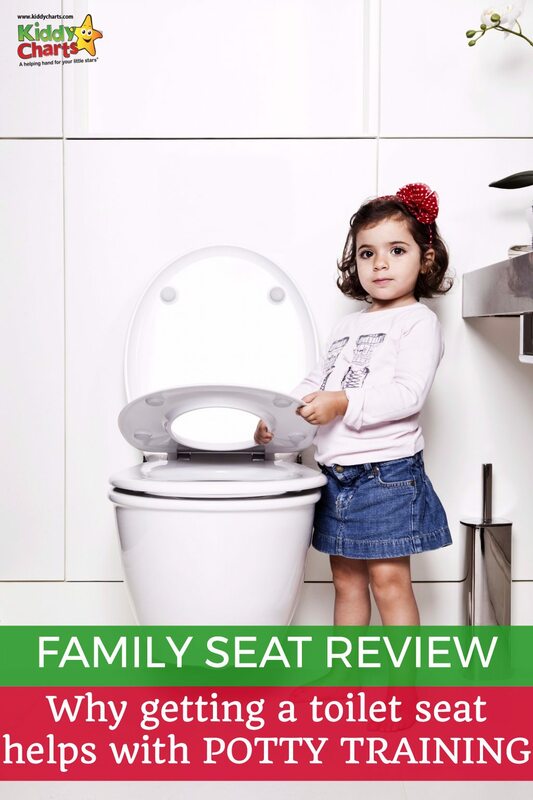 What did we think of The Family Seat as a tool for potty training? This is a brilliant idea. Straight-forward, unobtrusive, easy to fit, and perfect for the child that transitions from potty training, or just wants to be a little more grown up. Retailing at £39.95, it is a good price for the piece of mind that the extra potty training help it gives brings. For boys, if you are going to train them to stand up, you might also want to combine The Family Seat with a bit of target practise. We used to put a Cheerio in the toilet and see if our son could hit it! A very simple, but extremely effective idea for encouraging good directional control! When you think your child is ready, go completely nappy free, and see how you go. Don’t get upset at the accidents, but praise and reward the successes however you have decided to do so! Try not to remind them to go to the toilet too much too, just encourage gently, and perhaps they can go with you – they probably do so anyway, right?!? If you are simply transitioning from the potty to the toilet, just encourage them all you can to use it, using those rewards are you see fit. They are much more likely to get used to the idea without the worry of falling into the loo, we promise you. The Family Seat is a great idea for giving a little extra potty training help to your little ones. Sometimes the fear of falling into the toilet is a key barrier to transition, and toilet or potty training generally. This removes that, giving your kids more confidence to tackle the toilet with pride! And you can’t say fairer than that, right? *This offer is valid from Wednesday 27 September and will run until and inclusive of Tuesday 10 October. It is valid for the UK only, and doesn’t include postage. Thanks for the detailed review. I’m going to check it out.